Please note The teams you create in the resources and allocation overview are only visible to yourself. Other InLoox users in your system cannot see the changes. So editing or deleting a team member has no effect on the resources and workload view of other InLoox users. You can create individual teams to see the workload of cross-department project teams. 1. Open the Divisions and Teams side panel and click Add Team. 2. Click on the Edit button and enter the name of the team. 3. Add team members by clicking on the Add Resource icon . 4. 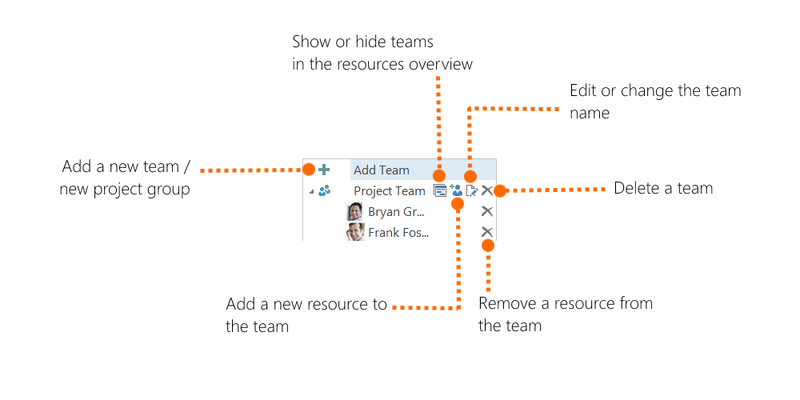 Show or hide Divisions and Teams in the resources and workload overview as needed. You can see that a team is not shown in the overview when the Display icon is gray . When it is blue then it is shown in the overview. Alternatively, you can also drag-and-drop a team into the overview. Add a new team | InLoox 9 for Outlook • Copyright 1999-2019 © InLoox, Inc. All rights reserved.